Townsville's Indigenous history spans thousands of years and finding remnants of that history can be difficult. Aboriginal paintings are art made by indigenous Australians and is closely linked to religious ceremonies or rituals. Ochre is a natural clay earth pigment which is used to create the paintings. It's a mixture of ferric oxide and varying amounts of clay & sand and ranges in colour from yellow to deep orange and brown. Ochre containing a large amount of hematite, or dehydrated iron oxide, has a reddish tint known as "red ochre". 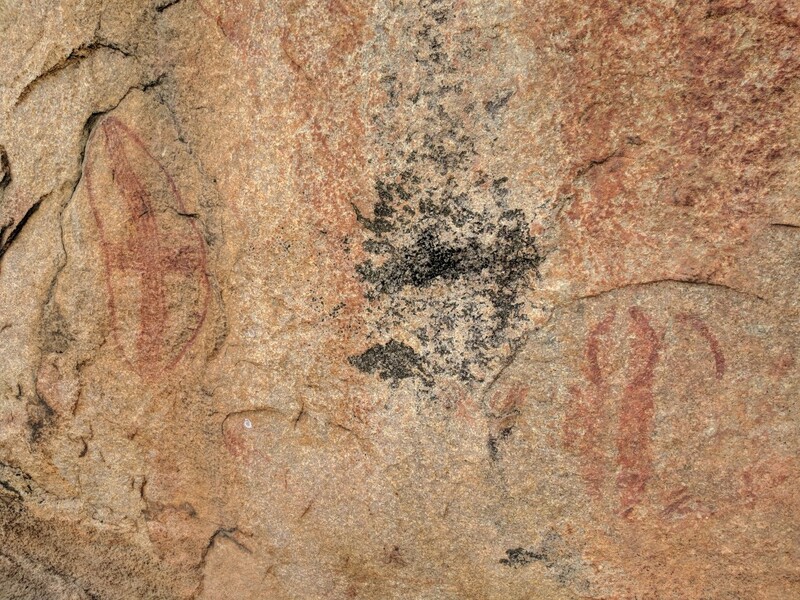 Townsville surprisingly has a lot aboriginal rock art to offer within half an hour's drive, roughly the traditional land of the Coonambelah people and the northern extremity of the Bindal (or Biri) people and the Wulgurukaba people, and demonstrates considerable research potential. 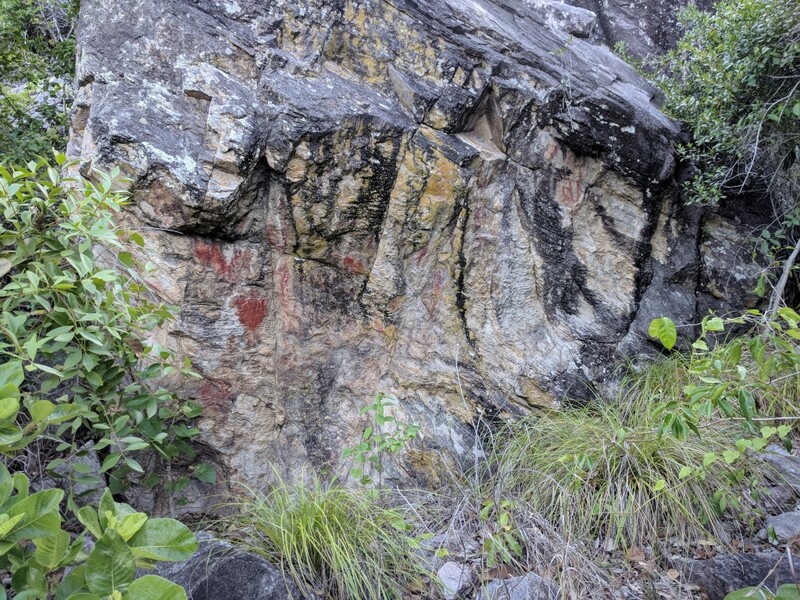 There are over 50 sites but most of the information and locations have been lost throughout history (this number includes some that are small groups of closely associated painted boulders). The only remains are a few mud maps and an illustration of 'shields'. The majority of the sites are in the Clevedon area. Access to these places can be problematic. As always, please respect and treat these places with great care. Please do not graffiti or litter and dispose of human waste correctly. The map and illustrations are all based on the work of Helen Brayshaw who started researching local Aboriginal evidence in 1973, and produced a lengthy thesis in 1977, which was then published in 1990 as "Well Beaten Paths", by JCU. At some later date when fashions changed, they decided to shred their remaining stock but luckily they were rescued by Townsville Museum, where you can still buy a copy for $16. Liz Hatte later revisited this topic and wrote "Boring Coastal Stuff". 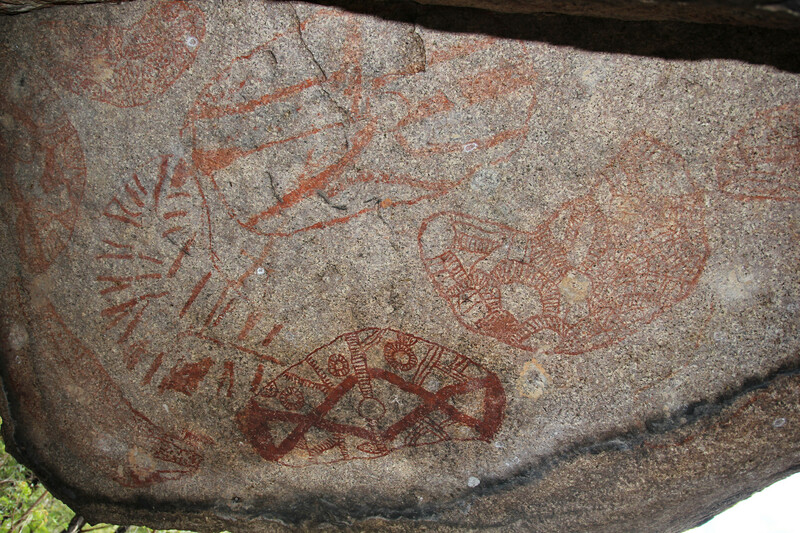 Rock paintings in the Townsville region published in a thesis in JCU library. Image on right adapted from Hatte 1992. I believe there is a huge story to tell about Aboriginal culture in the Townsville region, and there hasn't been any serious study since perhaps the 1980's and most of that has simply disappeared. 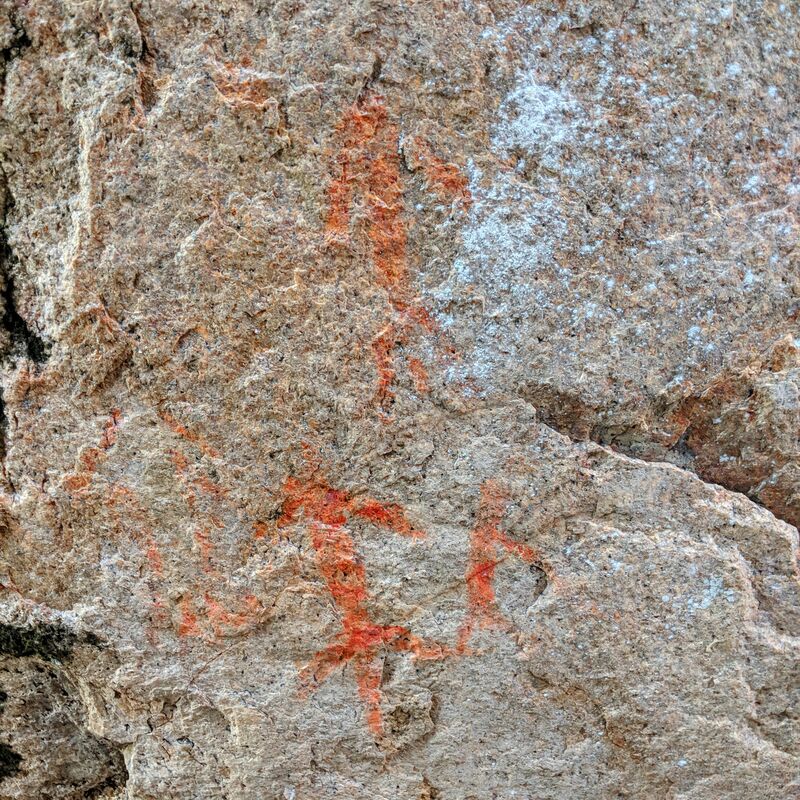 As you may have gathered, a lot of the rock art is very faded, and sometimes software is needed to enhance & reveal the paint. The Aboriginal shields were made about one to two hundred kilometres further north in the rainforest from the buttress root of rainforest fig trees (Ficus sp. ), and were traded into the Townsville area. Used for battle and ceremony, they painted their shields and weapons for power, protection and identity. They also had a close association of shields with honour and manhood. 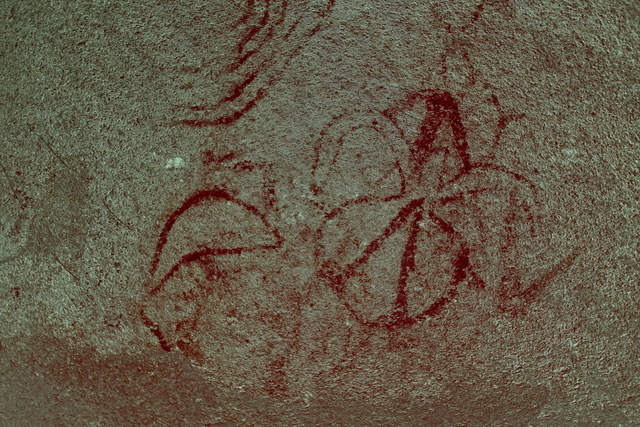 One area in particular, Mount Elliot, was set aside as a national park partly for the preservation of its rock painting sites. The eastern side of this park is extremely rich in sites. A major group of more than sixty painted granite boulders lies only metres from the main road (the Bruce Highway) just south of Townsville. This is the group on Mount Elliot's eastern side. 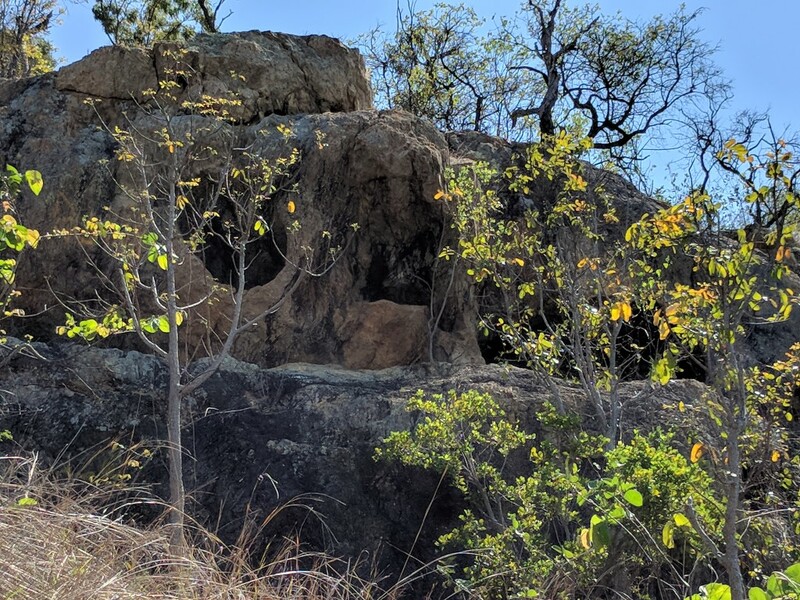 Located at the base of Mt Storth, this area is by far the best of the aboriginal rock art around Townsville in my opinion and is known as 'Clevedon' by some locals. When the highway was first planned to be built, it was going to go straight through the hillside which would have destroyed these historic sites. Thankfully that never happened. 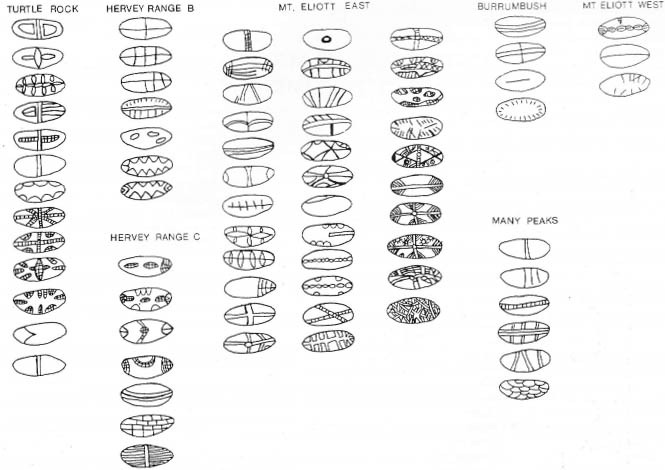 With these numerous rock art sites in the Clevedon area, it seems that it may have been a highway along the coast also for the Aboriginals, perhaps also a meeting place. They are well hidden so you will need to climb through and look around at all the rocks. Allow one to two hours to walk around to fully appreciate this significant area. Aborigines use to choose specific areas to place their art. It needed to be a memorable area with features that stood out and had a canvas for their art which was protected from the elements, preferably where a slab of granite freshly peal off revealing a new and unweathered, rock. 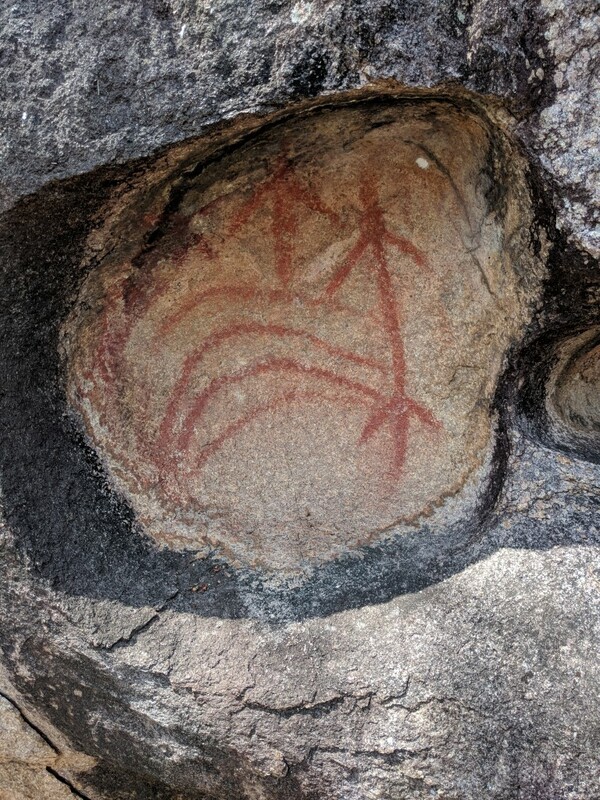 There are also a few paintings out at Cape Cleveland near Cocoa Creek, Launs Beach and White Rock Bay near the beach below a large perpendicular rock. 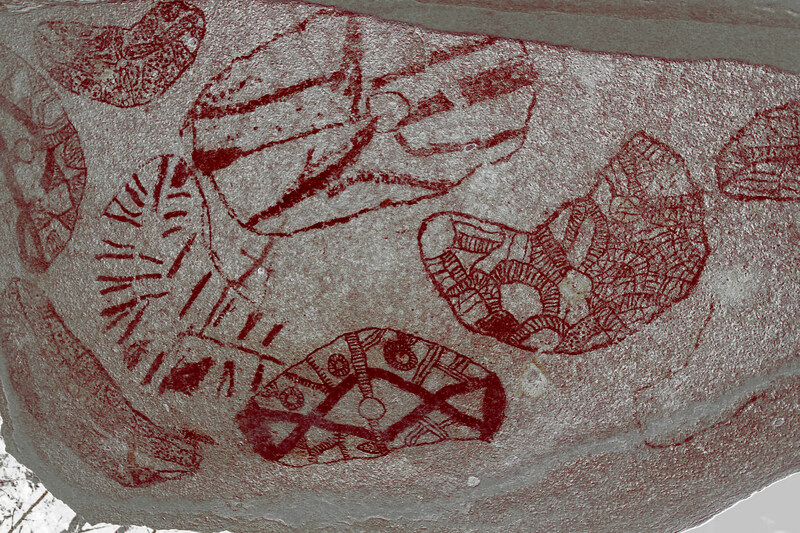 People who have researched these paintings are of the belief that there could be rock art just about anywhere. There are numerous rock shelters where there is no evidence of habitation. 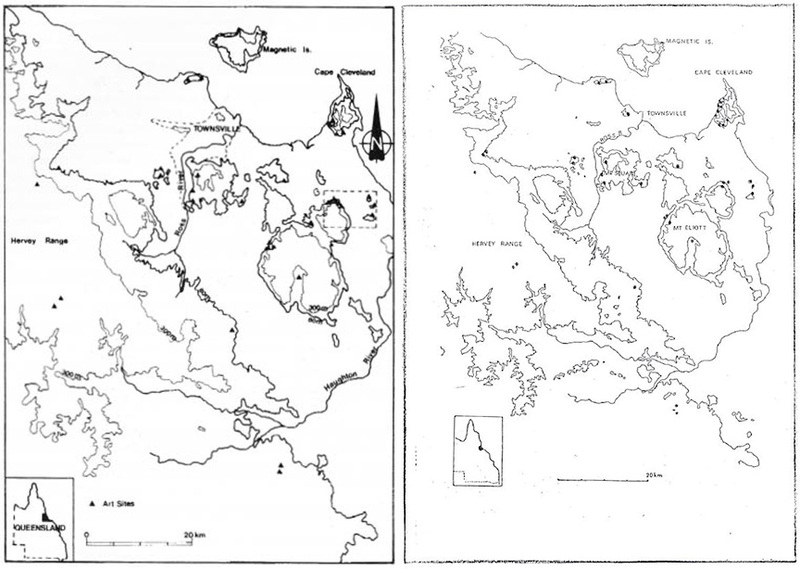 There is also mud maps referring to sites at Mt Elliot seemingly near the fork of Alligator creek and Cockatoo Creek, Major Creek, and also at The Cone & Feltham Cone near Burrumbush Creek. 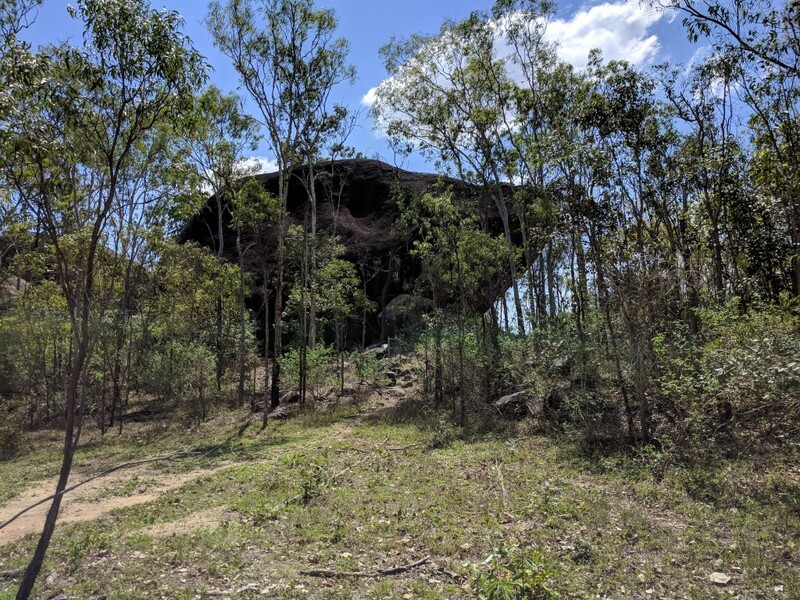 Turtle Rock is not a well known tourist attraction located out at Harvey Range on Table Top Station. Most locals wouldn't know it existed. Peel through the log book when here. 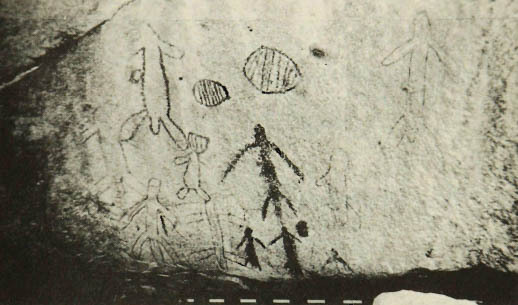 Beneath Turtle Rock's eastern side there is a fairly spacious shelter with a palimpsest of rock paintings and with widespread though apparently shallow floor deposits. 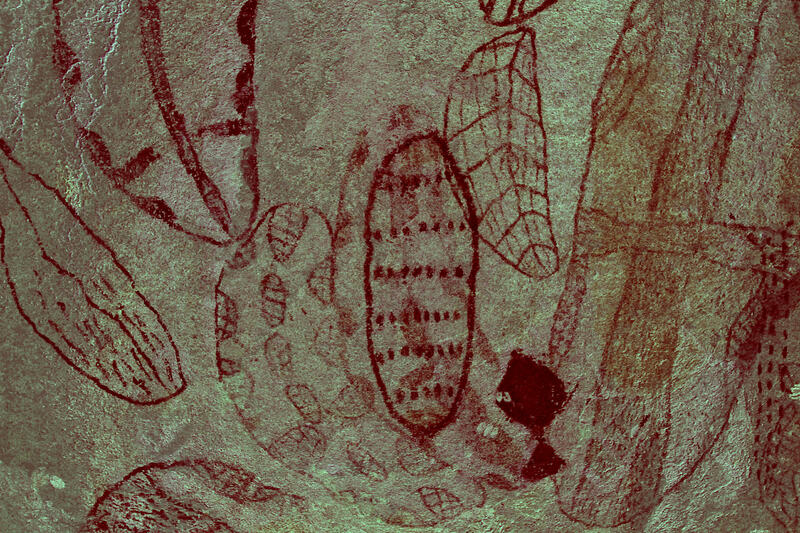 It's is basically one large rock that has a underhang where the entire surface is covered in aboriginal art. 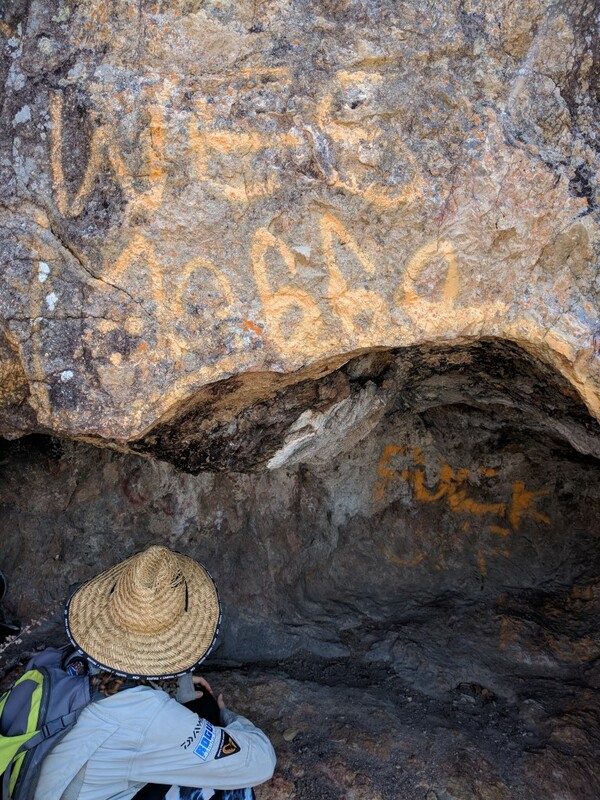 There is in addition a crawl-space which connects the eastern entrance and the main area of rock paintings with a 'window' to the northwest. Please note that permission is required to access Table Top Station. Turtle Rock is only a five minute walk from where you park your car. The vegetation is generally of the dry tropical savannah woodland type. Trees are mostly dry sclerophyll species but there are a few tropical rainforest species in the immediate vicinity, especially amongst the moister rocks and along the wetter creeks. 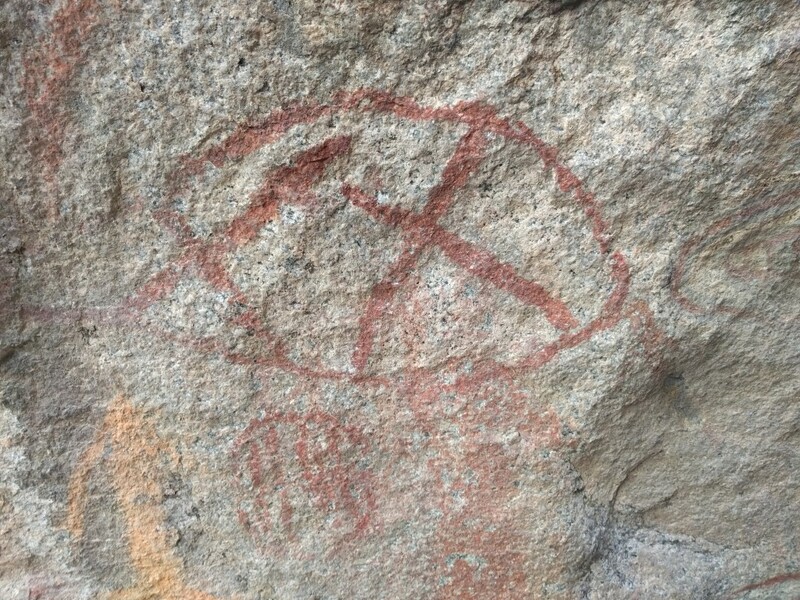 Turtle Rock Art Site has been a place of importance to Aboriginal people for over 4,000 years. Archaeological research here has shown that people lived in the shelter, cooked and ate their meals and made their tools in the shade of the rock. Materials in the site have been carried up to 20 km and suggest that the site may have had some importance as a notable place or camp. 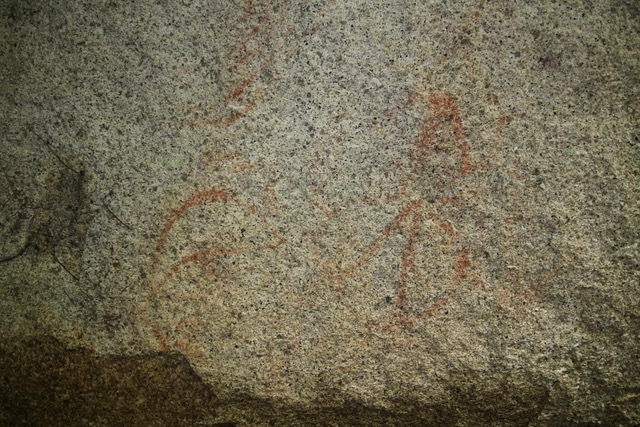 Art motifs at the site also indicate that social and spiritual activities took place here. The exact meaning of the art may not be known today, but this site still remains special to the Aboriginal people. 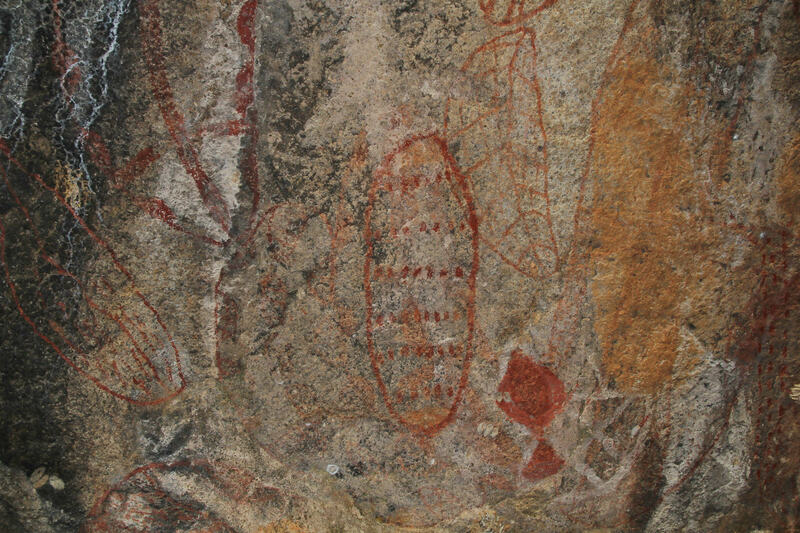 At the bottom of Hervey Range beside the highway is a bunch of large boulders featuring aboriginal rock art. These paintings are quite unique because a few of them were painted with laundry blue stolen from early european settlers. Before we had modern laundry detergents with optical brighteners, there was a mysterious little blue bag which was placed in the washing machine on the final rinse. This was called laundry bluing or blue. There is one faded blue painting and one that looks like it's has been gone over. There is also some that look new and non-aboriginal. Out at these boulders is also a rock climbing route that runs up the side of one of the boulders. 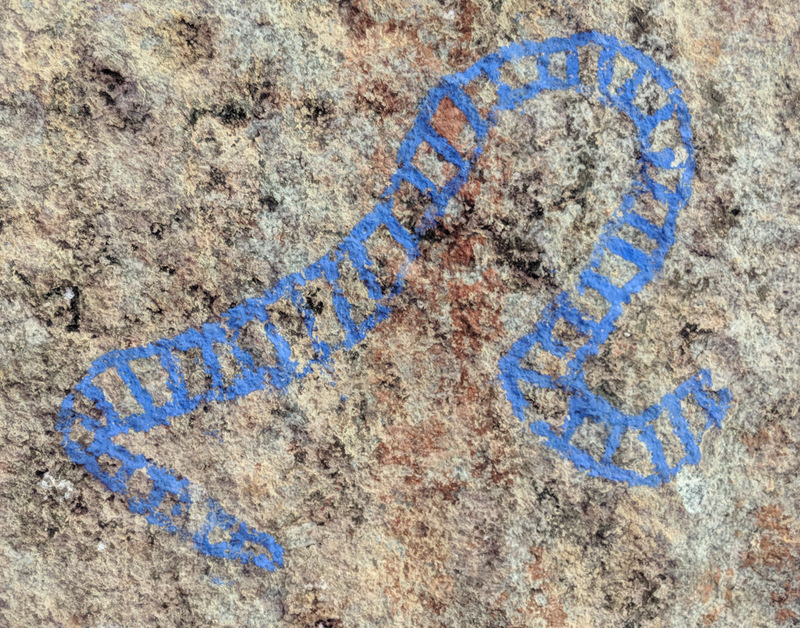 It's not near the rock art. *There are also a few other sites in the area. One of which is south of Turtle Rock in the distance near the hills near Fanning River which is now Army Land; my suspicion is that this is near the waterfall and slight mound out there. There is also a site near Leichhardt Creek in between Pepper Pot Mountain and Ross River Mountain and according to the mud map, there should be one out near Bunkers Hill and Redbank Creek. I've recently visited these area and found out that this area has been graffiti. It's always sad to see history vandalised. However, there is only one painting in this area which is significantly faded. If you look towards the Louisa hills, you will be able to see a rock feature with several concaves. The painting is in the far right hole. Also known as Many Peaks, Mt Marlow, and Townsville Town Common Conservation Park. There are two sites; one on the western end of Many Peaks and the other on the east. This western site is unusual in that it is almost out in the open and unsurprisingly, very hard to make out. It is just west of the Freshwater Trail, up the track a little and looks well visited by locals. 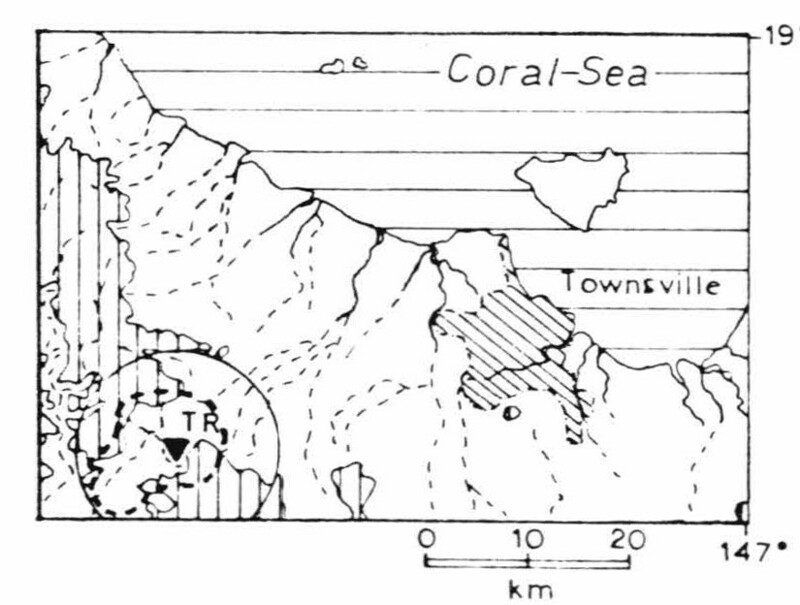 Many Peaks Range was the area that the indigenous were contained in because of the growing population of Townsville in the 1860's, and they were controlled by Inspector Marlow, hence Mt Marlow. 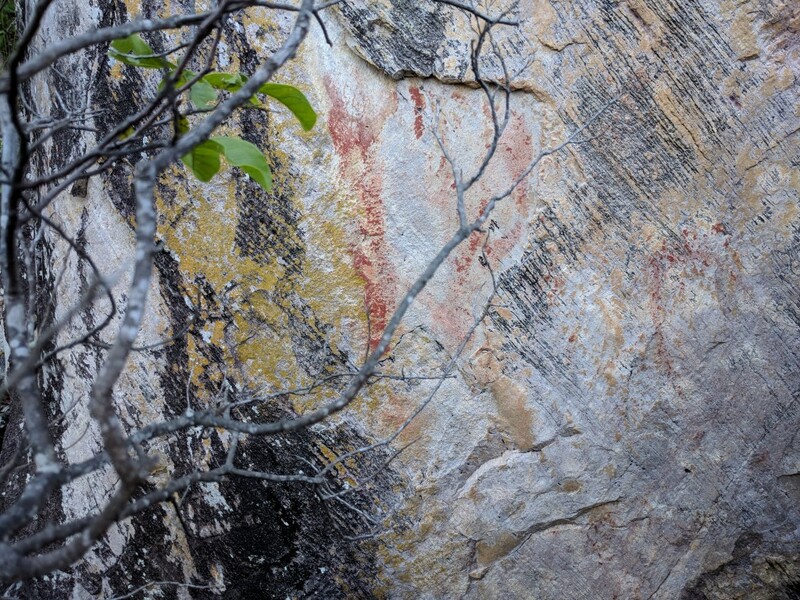 So there may be a few more hidden Aboriginal art sites in this area. 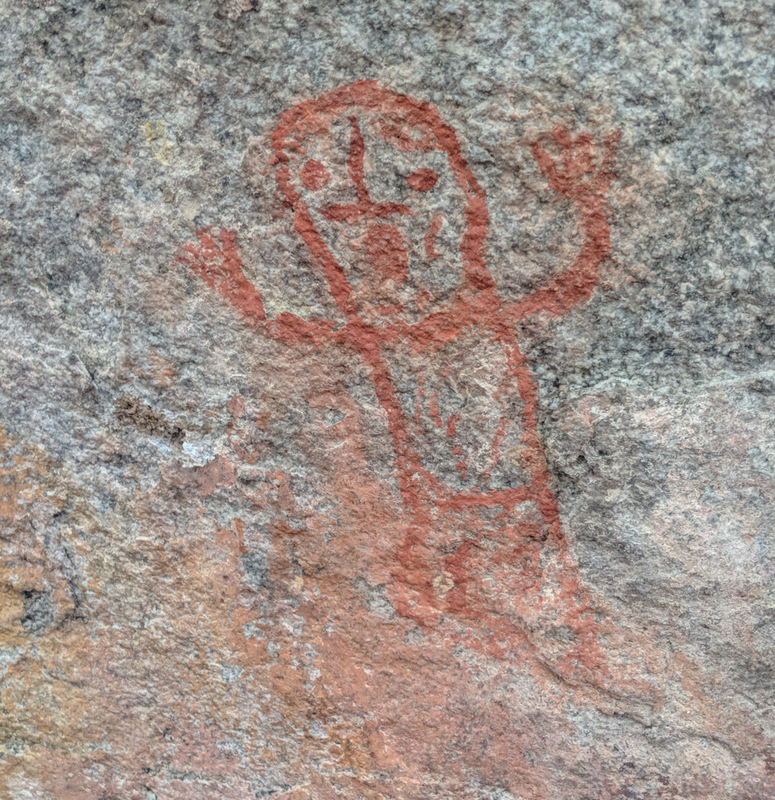 Though stick figures occur throughout the Townsville district in several sizes and forms, there is a great concentration of more than 100 at a single site on Mount Stuart, as well as at a similar site on Big Jack. 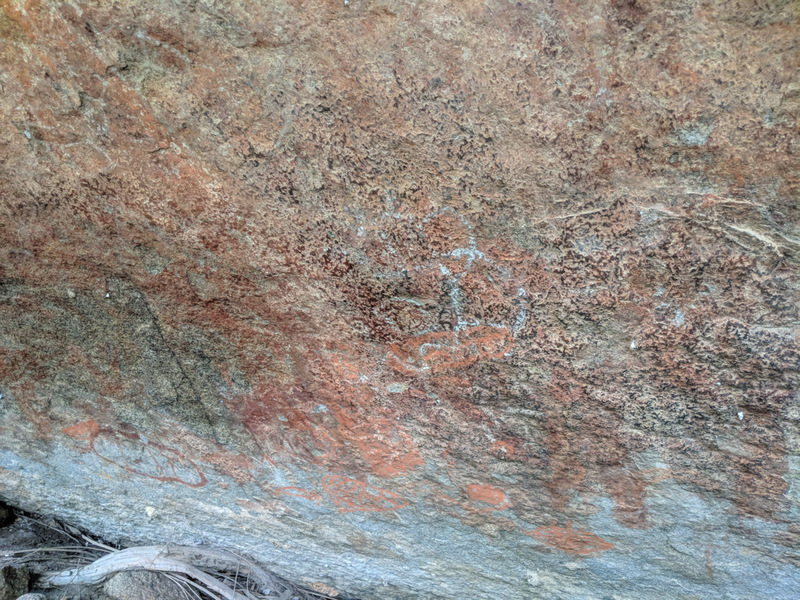 Under a rock, near Crystal Creek and next to Bullocky Tom's Track is a very faded Aboriginal painting. Aboriginal tribes in the early days were numerous in the coastal area at the foot of the range and an old Aboriginal burial ground is located on the slopes of Mount Ruth. 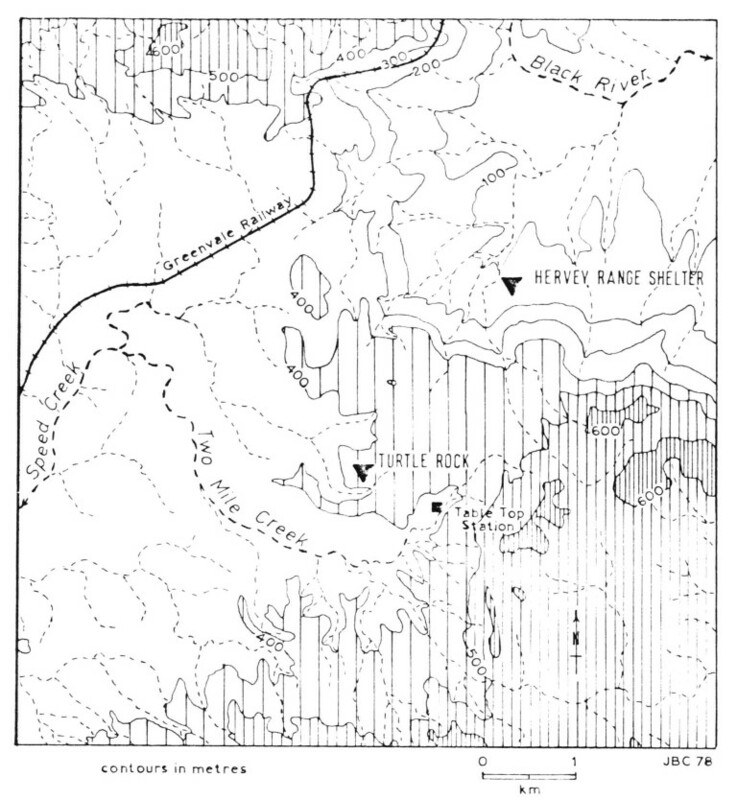 There is no record of native attacks in the immediate area - the nearest being at Pappin's Road and Hidden Valley. Towards the foothills in Mutarnee are a few other Aboriginal paintings. There are two trees that have been blazed at the base of the hill which mark the start of the walk. Just follow those trees straight up to the rocks. Death adders love this country so wear snake resistant gaiters. There are also a site near Jourama Falls in close proximity to the car park. There's a small aboriginal painting on Orpheus Island National Park to the left of Yanks Jetty. The Palm Island Group may hold several more sites like this. A few of these sites are right next to the highway but to the other sites, you will need to do a little bit of bushwalking. Please note that when bushwalking, there are no paths or tracks however here's an interactive map of the locations and ideal routes on how to get there. 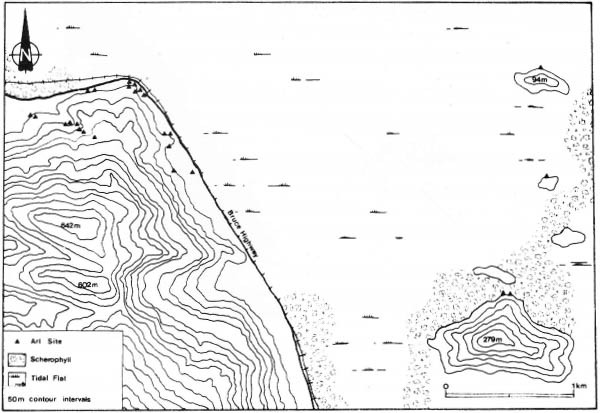 Also according to the revised mud map, there may have been a site on Castle Hill and on Magnetic Island but it's very hard to tell. This area is certainly a magical part of North Queensland. It's a strenuous walk and you'll need to be fit to climb up some steep hill sections. The bush track is rough and uneven underfoot.